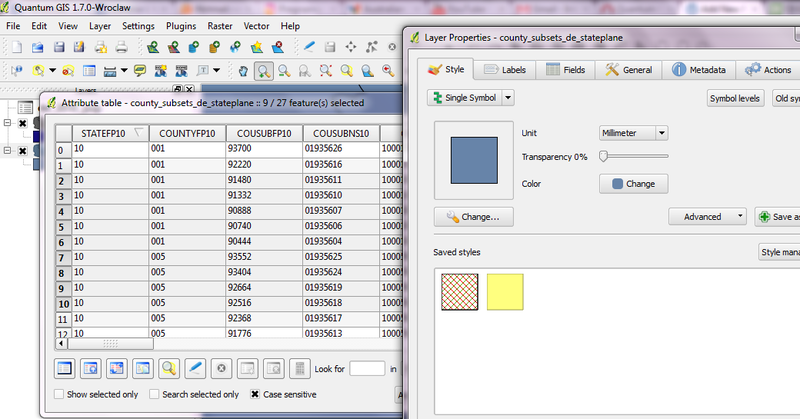 Default style for QGIS on windows. However there is one limitation. QGIS will not remember that setting as the compiled binary forces QGIS running on Windows into QPlastiqueStyle. I have started working on a patch to give the user a choice in the options which control rendering style they would like to use. I think choice in these situations is good because I have grown to like the QPlastiqueStyle, mainly because I have used it so much , but other people I know prefer the Windows Vista style controls. N.B. that sometimes the window won’t refresh properly when you change the style, so you need to minimise then restore it. > but other people I know prefer the Windows Vista style controls. Of course, if you are using the Windows classic theme you can get a nice clean, space-saving look… but using the windows style disables middle-click in scroll bars to scroll to location, so I could never do that! What other styles are there? I wonder if it is possible to enable middle-click scrolling for the Windows style… and if there is any other functionality that changes depending on the style. And now: Back to work…. “explorer” also seems to work on my XP install.